On the last day of October in 1517, a scholar and priest named Martin Luther did as priests commonly did at the time when they had something to discuss amongst the clergy, he nailed a piece of paper to the door of the Castle Church in Wittenburg, Germany. Unlike many other such documents nailed to the doors of churches, this one sparked a religious and social revolution that would change the landscape of Europe and the world forever. Like many other Roman Catholics of the day, Martin Luther was troubled by abuses going on within the Church, and the decadent lifestyles of many professing to abide by the rules of poverty, chastity and obedience. He had previously led discussions on these topics, but little came of his verbal debates. The last straw for Luther occurred when John Tetzel, Pope Leo’s top salesman, was ordered by the Pope to sell indulgences to pay for the restoration of St. Peter’s Basilica in Rome. In other words, the faithful were told that if they coughed up enough dough, they could buy themselves a spot in heaven, something most decidedly against scriptural teachings. Though Luther has come down through the centuries as a poking-the-bear sort of rabble-rouser, there is enough evidence to believe that he did not intend for his work to be debated widely by the general public. For starters, Luther composed his document in Latin, the language of scholars. Latin was largely unknown to illiterate common folk, and gibberish to most of members of the aristocracy and royalty as well. He pinned it to a church door, which was commonly done by scholars hoping to share their work with other learned men to allow for future discussion. But, at some point, someone took the document down from the church door and translated Luther’s theses into German. In modern terms, he posted some thoughts on a semi-private forum and his post went viral. Many copies were made and distributed among the people of Wittenburg and the surrounding areas. When Luther found out what had happened, he tried to get back his original copy, but the genie was already out of the bottle. Most people were illiterate in 1517, so a person who could read would stand center-stage in a well-traveled public place, such as a market square, if he thought he had something of general interest to pass along. This is how word of Luther’s 95 theses and his outrage over the local people being ripped off from indulgences spread through the area. The people of Wittenburg were strapped for cash as it was, and didn’t take kindly to the idea that a comfy seat in heaven didn’t have a “reserved” sign with their name on it thanks to their indulgences. Luther’s work spread through Germany like wild fire, and news of his theses and its popularity with the common folk finally reached Rome. Pope Leo X gave the German cleric several opportunities to recant and repent. 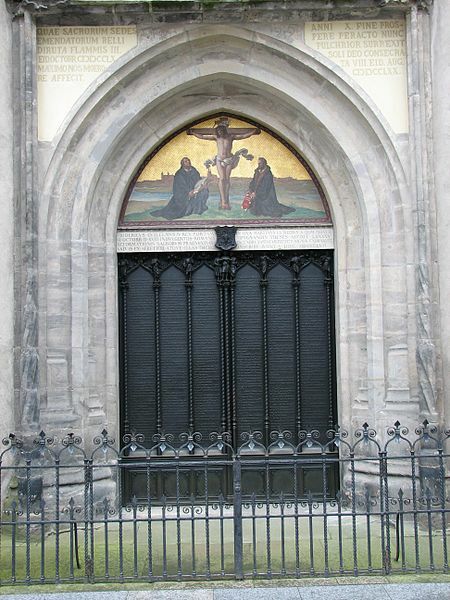 Luther said he’d pass, and in 1521 he was officially excommunicated from the Catholic Church. “Upon the advice of our council, several other princes and prelates from our lands and domains and other good people of our company are also in attendance. We have finally arrived at the following conclusion. By the authority vested in us… the sentence is to be executed against Martin Luther and his false doctrine (already condemned by our Holy Father the pope, the true and legitimate judge in these matters)… We have declared and hereby forever declare by this edict that the said Martin Luther is to be considered an estranged member, rotten and cut off from the body of our Holy Mother Church. He is an obstinate, schismatic heretic, and we want him to be considered as such by all of you. Luther, fortunately, had the protection of a German prince named Frederick, and under his care began writing a German translation of the Bible, which took him ten years to complete. He died in 1546 of natural causes. Luther’s actions were but one spoke in the wheel of a Reformation sweeping all over Europe simultaneously. Even the most devout Catholics realized change was desperately needed to eradicate rampant corruption and hypocrisy within the Church. For better or worse, the rise of nationalism went hand-in-hand with the rise of Protestantism. The days of a Europe more or less unified under one church were over. It is amazing that those who own/manage this site would allow an article on this subject to be posted without first obtaining the facts from an objective and highly educated scholar on the topic. The author of this article shows the typical anti-Catholic ignorance and predudice/bias that one would have thought had been purged from society since the Second Vatican Council (which ended in 1965). First of all, Luther was a “Catholic,” not a “Roman Catholic” (there being no such thing in official terminology). The latter term was invented as a slur by non-Catholics in Europe, who falsely accused Catholics of loyalty to a “foreign prince” (in Rome). Second, “poverty, chastity, and obedience” are not “rules,” but rather are solemn vows taken by the men and women in religious orders and congregations (e.g., Franciscans, Carmelites, Dominicans, Augustinians, etc.). The author, while later revealing that Augustinian Father Luther later attempted to enter into a marriage, never points out the irony that he and his “wife” violated their own vows of poverty, chastity, and obedience. This is absolutely wrong — the most amazingly incorrect statement on the subject that I have ever encountered on the Internet. Even a mere reading of the Wikipedia article on Tetzel would have helped the author, in her preparatory research, to see how great were her misconceptions: First, popes do not have “salesmen.” Second, Pope Leo X did NOT “order” nor authorize Father Tetzel to “sell indulgences.” The author demonstrates no understanding of what an indulgence is and how/why it is granted/obtained. Tetzel (and allegedly some others in northern Europe) acted improperly, due to their own apparent misunderstanding of the doctrine of indulgences, NOT because they were carrying out the pope’s will (which they most definitely were not). Luther was right to criticize Tetzel’s errors, but, in his pride and irascibility, he lost his self-control and eventually slipped into heresies that were much worse than were Tetzel’s selling of indulgences. The owners of this site need to make a concerted effort to purge their pages of all the anti-Catholic bigotry that they contain. Very well said…thank you for your corrections to this highly biased “article”.